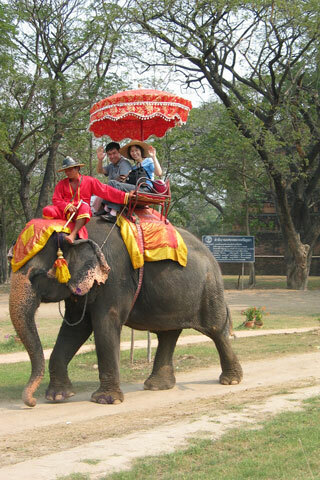 Keeping Ayutthaya’s pachyderm tradition alive, Ayutthaya has a couple of elephant camps employing some of the animals trained at the Royal Elephant Kraal to provide rides around the ruins. By far the most popular venue is the so-called “Elephant Palace” located within the Historical Park on Pathon Road. Here you can take a 15-minute ride along the roads fronting Wat Phra Ram and Wat Phra Si Sanphet. A second, less-popular “Elephant Village” is located out near the Ayutthaya Floating Market and offers rides through minor ruins near Wat Maheyong. A 15-minute ride costs 400 baht -- rather pricey for such a quick excursion. If wanting to skip the ride, anyone can view the elephants in their kraals and feed them sugarcane for 20 baht. Steer clear if you’re concerned about safety, as a woman was stomped to death after trying to feed an elephant in 2013 -- not the last time that this has happened in Thailand. From an ethical standpoint, some experts feel that it’s inhumane to ride elephants at any place except for on their super-strong necks. As with other tourist elephant camps in Thailand and elsewhere, the Ayutthaya elephants support a mahout on their necks and up to two people in seats strung to their backs -- quite a lot of weight to take on at once. Located on the northern fringe of town, the people at Ayutthaya’s Royal Elephant Kraal claim that rides provide good exercise for the animals. You might consider spending a couple of nights up there if you seek to really get to know one of these remarkable animals.